As per my post the other day about being on my own and getting creative. I had a ball. Or a bead. I got productive. 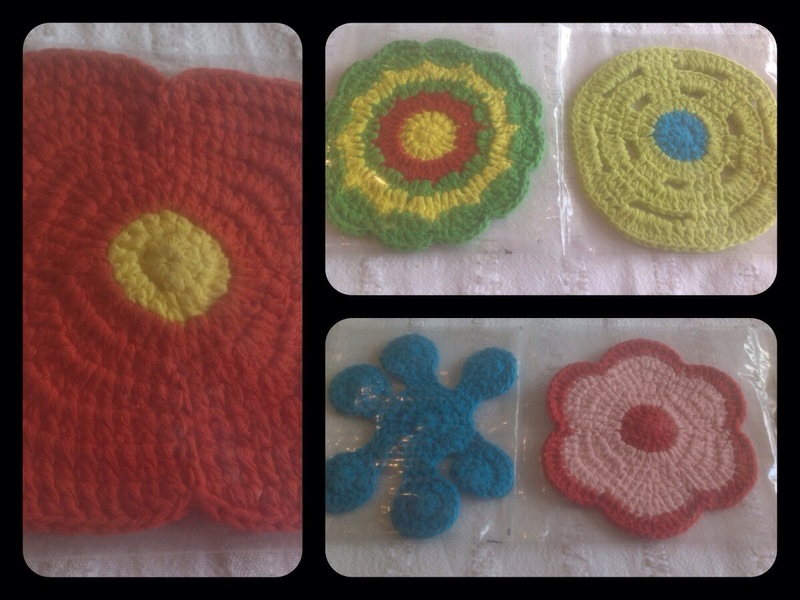 I needed to make some new items to take to market and add to the website. I will also be taking some to a little shop that expressed interest some back and see what they say. 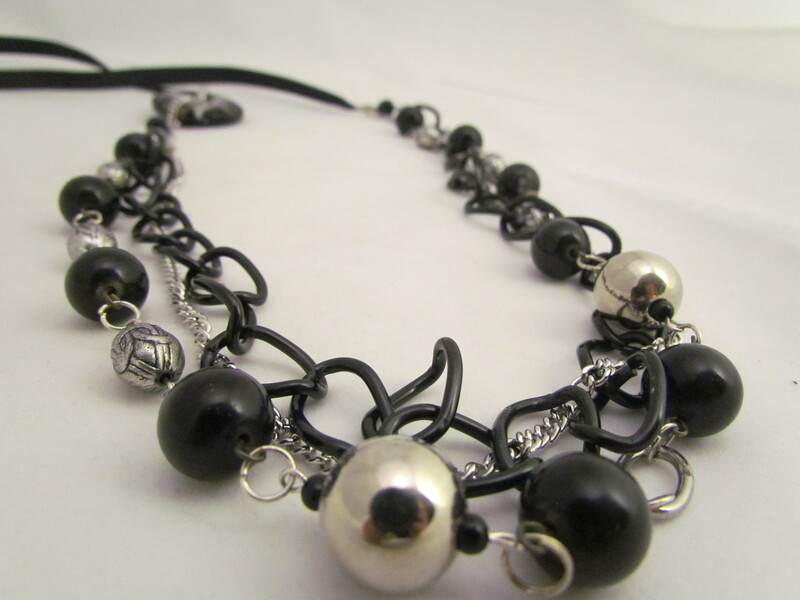 Some of these pieces are completely new, others are old necklaces just re worked into my new style, which I really like. 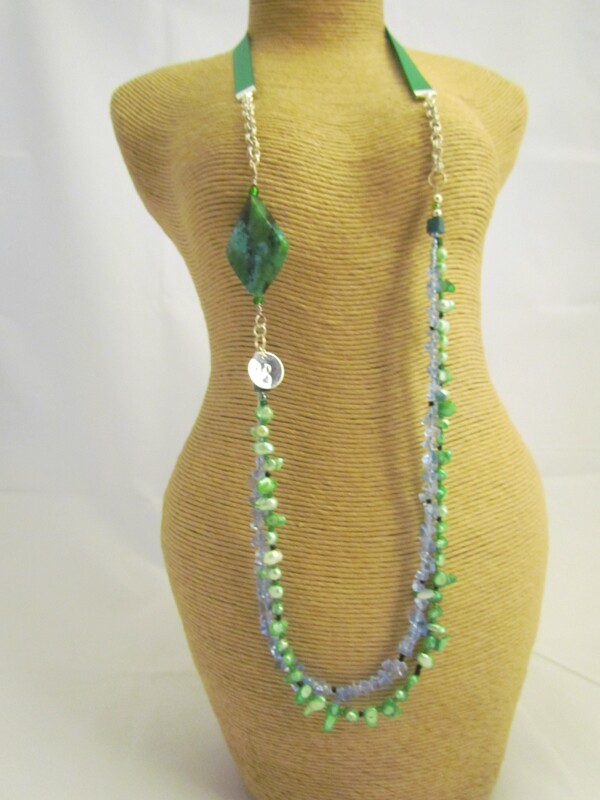 Take the green and blue Chrysocolla one (with the diamond-shaped focal bead), it’s so much nicer than the simplistic two strand with centre focal bead. I have had a good response from these funky imitation howlite skulls so I will work on getting some more and making a collection of them. 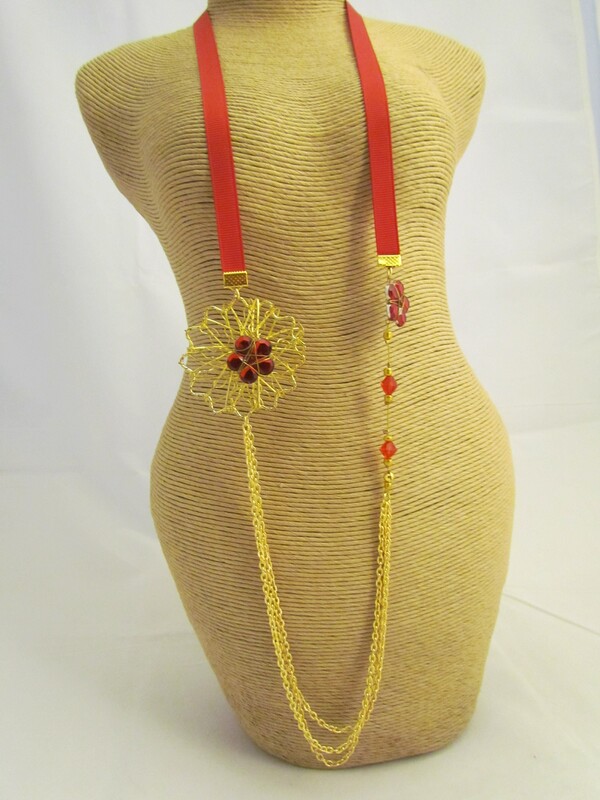 Simple strung necklace and earrings, with an assorted mixture of colours, and earrings to match. 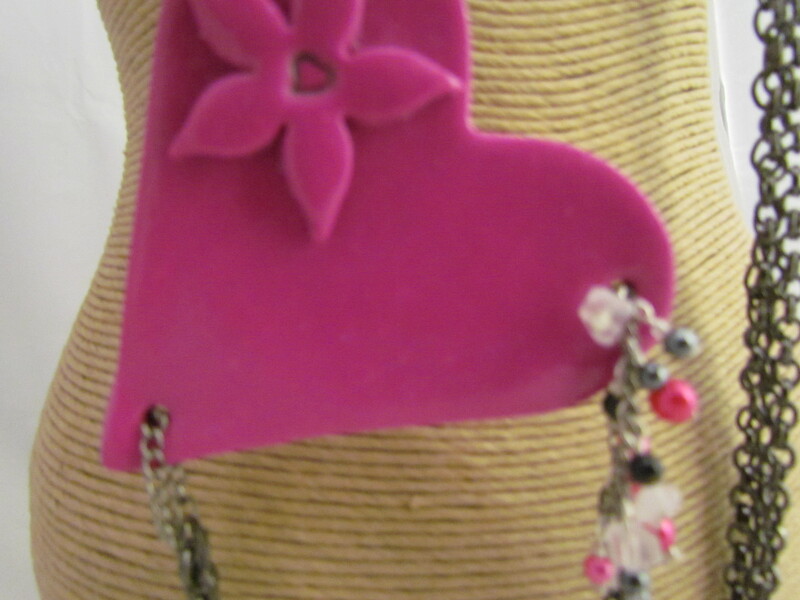 My website will be updated with the new items today, and my new weekly special is up and running on Facebook. 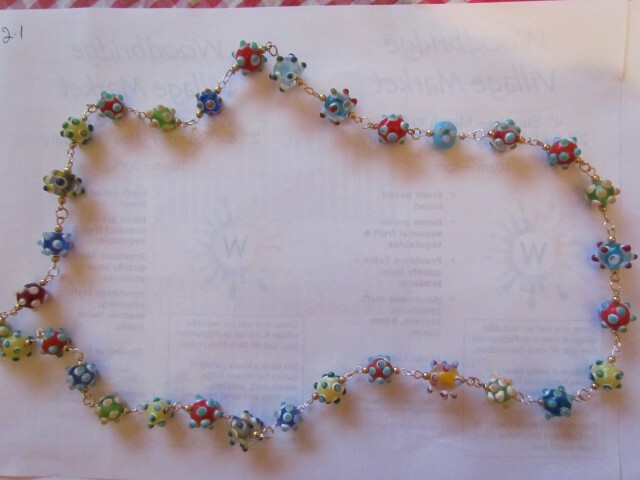 Glass beads with wooden flower focal. 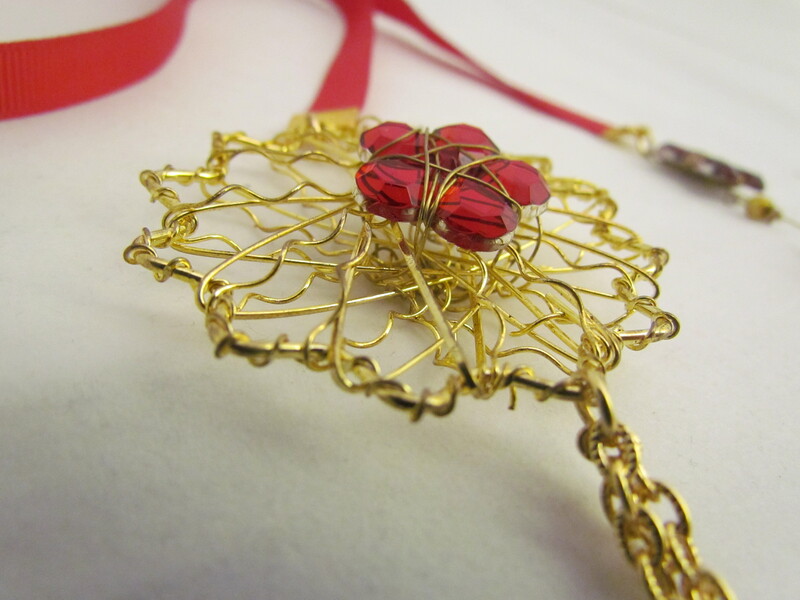 Gold wire flower with wire wrapped flower and multiple chains. Jasper with potato pearls and chain. 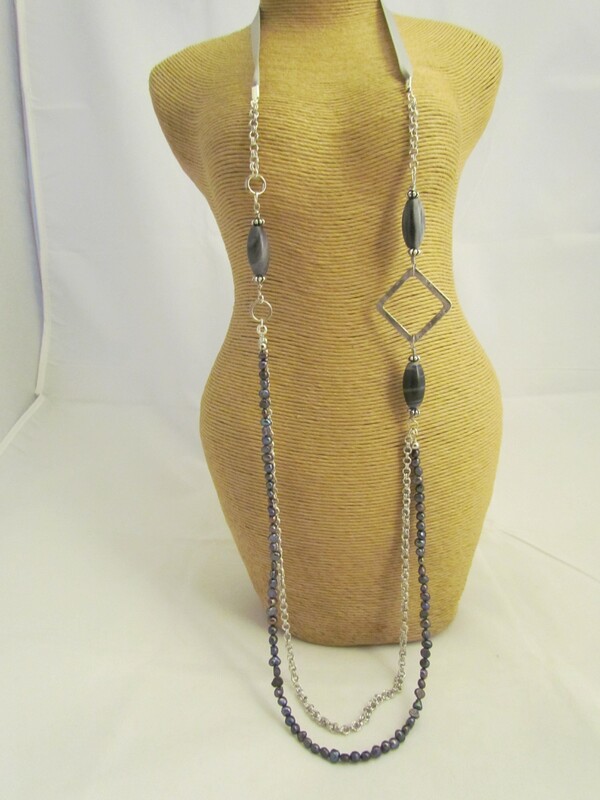 A matching two strand bracelet is also available. 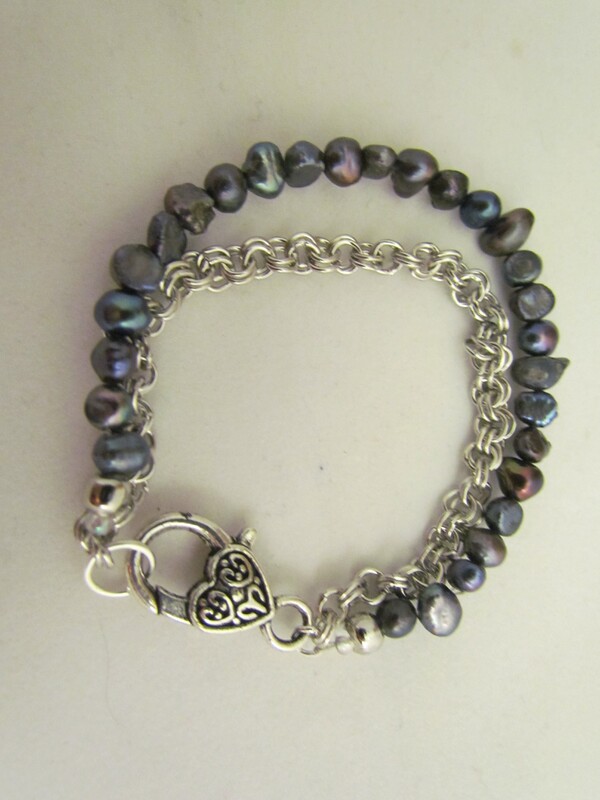 pearl and chain bracelet to match the necklace, or wear alone. That heart. This is a hard one for me. I’m not sure I like it. I think the heart is just too much, too big and clunky. Please, tell me your honest thoughts. Keep or toss! A re-modelled piece. 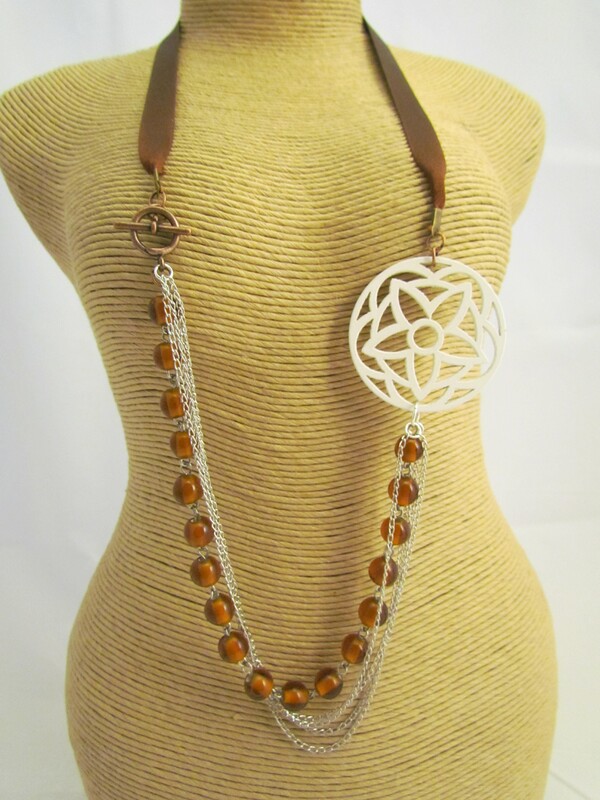 The chain and donut have been switched around with ribbon added. I really like this one. A little sunshine for your day. 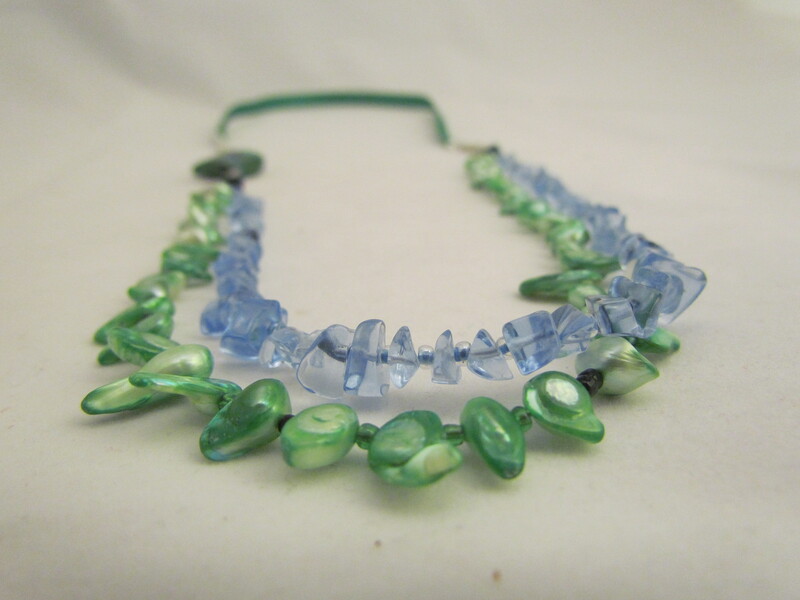 Chrysocolla with pearl spears and ribbon. Beautiful and bright. 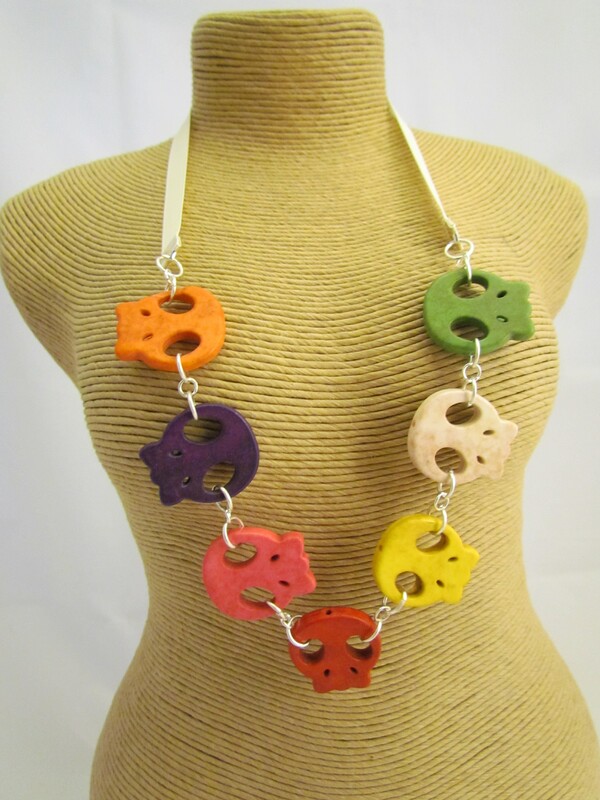 Have a great beady day, and keep an eye on the website, these and more will be available soon. It’s been a few weeks since I’ve been here, and I haven’t done a damn thing craft wise. I have changed the blog theme again, after I posted that it was all good. I like it much better now. This is the one, and my new catch phrase is there at the top. I think that it encompasses my style well enough. 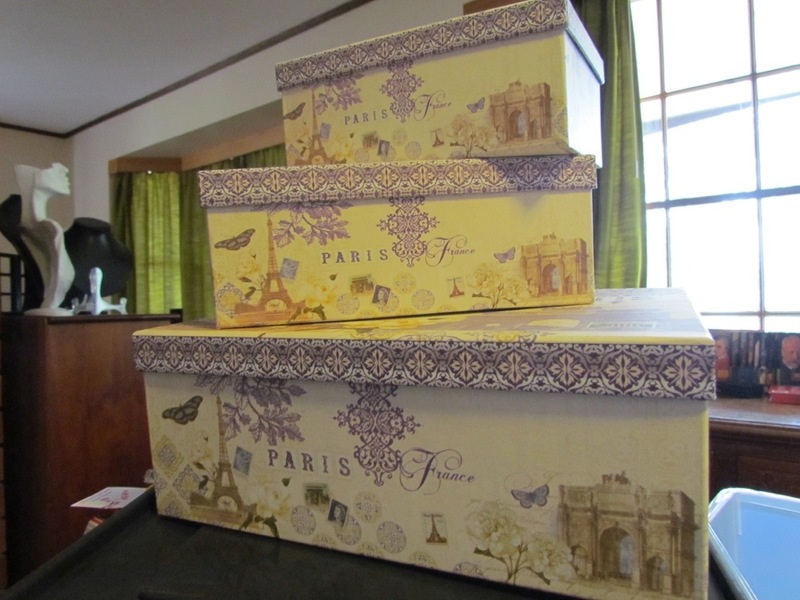 I have done a little more thinking, and today I bought some boxes for props. Even though they wont be used for carrying items, not all of them anyway, they wont be taking up extra space, as some of my other props will be relegated elsewhere. Never fear, they wont be gathering too much dust, I have plenty of chances to use differnet props. 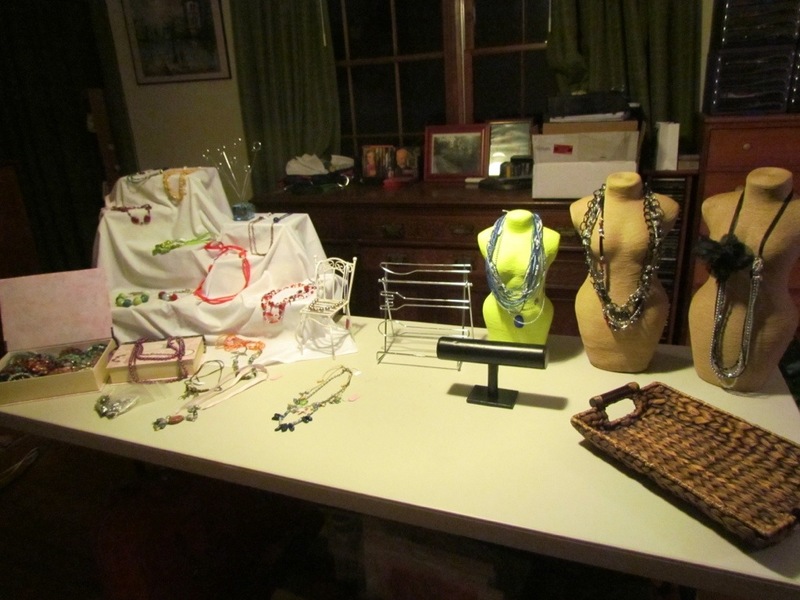 I have decided on a feminine and retro vintage styled display. 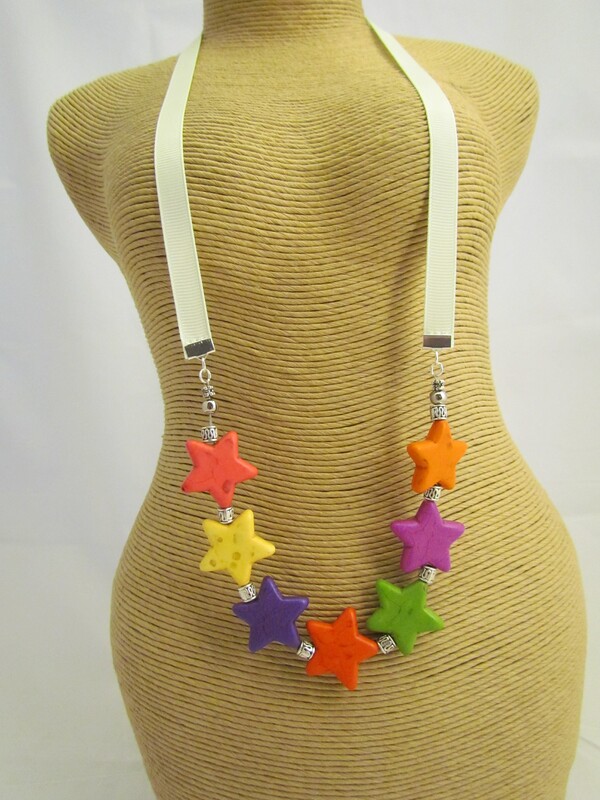 Something that accentuates my new jewellery and yet is an easy display to utilise. I feel this is the basis of my style, not totally retro or vintage, but a little of both maybe. Definitely feminine and funky. And totally Eclectic (according to the dictionary’s meaning – taking bits from different styles and using them all). 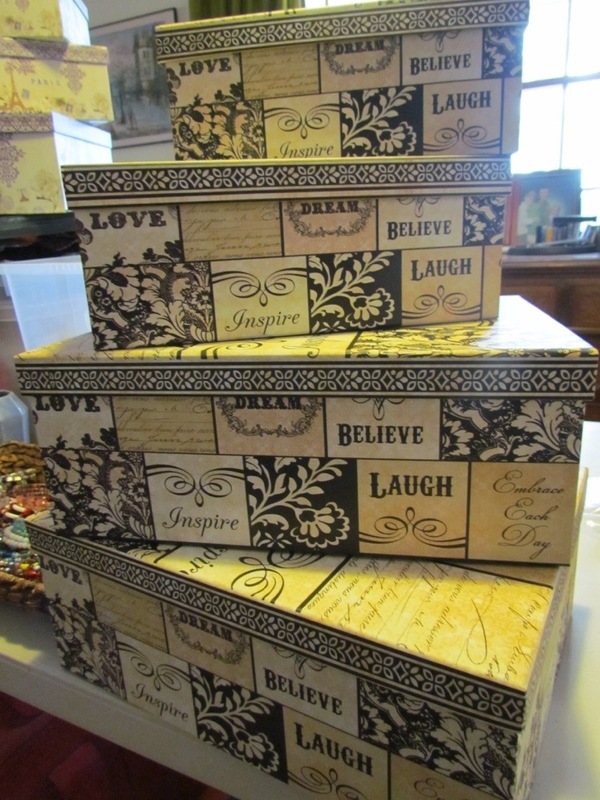 One set of boxes and ‘books’ all have the vintage Parisian look and pictures, while the other is slightly different with the words dream, believe, inspire and laugh on them with funky floral type patterns. Retro and funky, while still being inspirational. 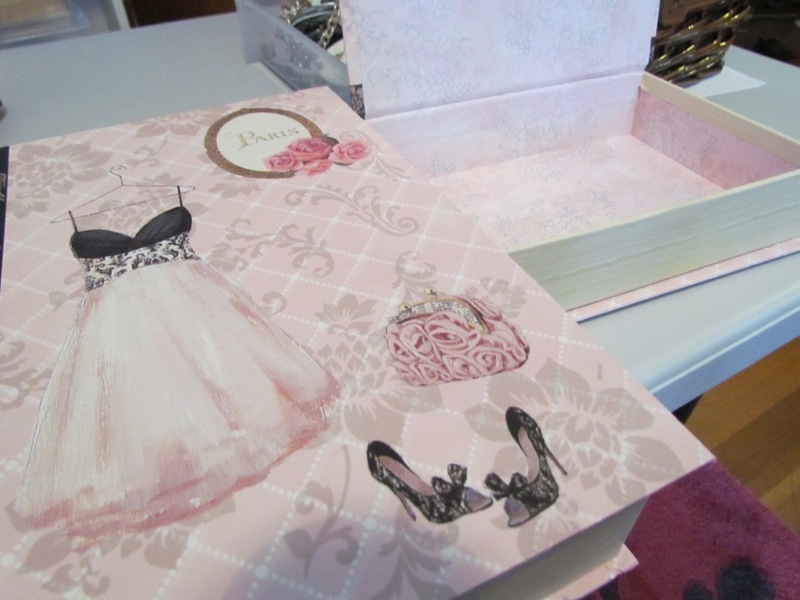 This idea was all well and good until I set it up and realised that maybe the boxes would outshine the jewellery. Eek. I didn’t take that into account. 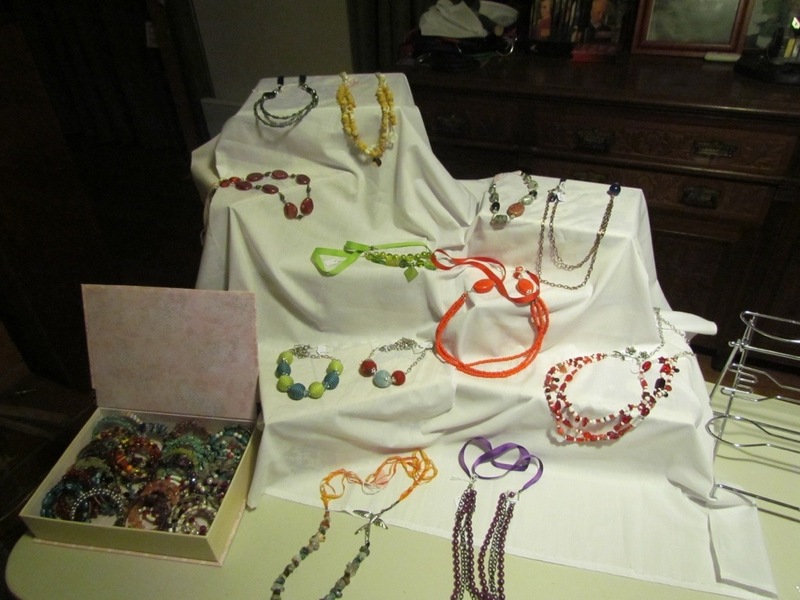 They were covered with my white cloth and boxes turned into a mountain (thats what I saw, a rugged white mountain) and I draped necklaces over the edges, and added two earring stands. It looks much better. I might try it one day with bright pieces only on the darker boxes and see if it works. Below is the mock set I did, only half done I know but the space is allocated to smaller items. I make sure all the large pieces and stands fit before anything else gets done. Please excuse the crappy night time pictures. I will do a short post tomorrow with it properly set up for market, hopefully it will look a lot better. I have packed my boxes for market and I am really happy that I now only have 3 instead of 4 boxes, but there is less jewellery and so less props. If it all falls to shite, I can easily revert back to the way it was, but I am already liking this, weird as that may sound.